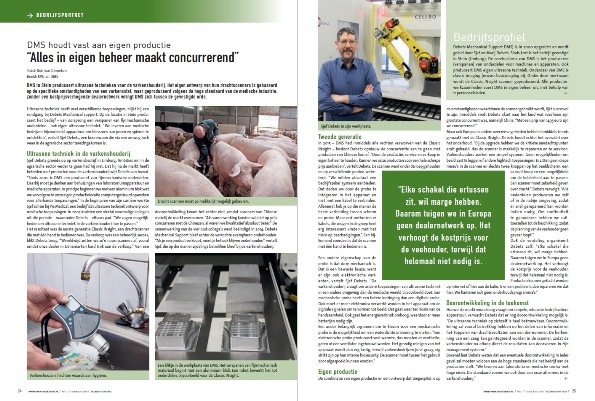 Dutch pig farmer magazine Varkens in Bedrijf visited the Classic iNSight2 factory, and followed the production process from a aluminum billet to the final testing stage. After a tough examination procedure, the Classic iNSight won this prestigious prize in its home country of The Netherlands. At the Danish Agromek fair, the iNSight received the maximum 3-star rating for new products. At the British Pig and Poultry Fair, the Classic iNSight was awarded Best New Produc on Show. During the LIV in Hardenberg, there was a lot of interest for the Classic iNSight2. With appr. 12.000 visitors it was a very busy exhibition where we were fortunately still able to properly discuss the product and its use with the many interested farmers. The Classic iNSight2 which was submerged in water for three days was an eye catcher as ever. For a water proof scanner no burden, hence it went back in the demo pool straight after the show. At the VIV Europe in Utrecht, The Netherlands, there was a special place for the Classic iNSight at the PIT stop, the Pig Innovation Theatre where a select number of innovative products were at display. Classic Imaging won the MKB Limburg Innovation Prize. The company developed a handy pregnancy scanner, the Classic iNSight, which allows very fast detection of pregnancy in sows. In the mean time the unit is a great success in the USA and several European countries. A beautiful example of the innovation power of the Limburg SME’s. It is the ultimate entrepreneurial dream. Working out a good idea, find an enthusiastic market worldwide and win a series of prizes and awards. Because in addition to the SME Innovation Prize Limburg the scanner was also good for professional awards in the United States, Denmark and England. Good for a growing contract flow and therefore financial success.